Time to talk all about the Village of Ashwaubenon, WI. Many of you may know that this part of Green Bay is home to Lambeau Field where the Packers play. I’m here to write about what you may not know about Ashwaubenon! It’s said that Ashwaubenon was named after Sioux Chief Ashwaubamy. His two daughters owned the land know as Ashwaubenon. The daughters began selling off parts to local farmers and landowners in the late 1800’s. Ashwaubenon was founded and named in 1818. Read the full history and learn all about Ashwaubenon here. Because Ashwaubenon has about 20 different parks, check out this link to see a map and key of each park. Most of these parks have jungle gyms for the kids, soccer fields, tennis courts, and baseball/softball fields for the kids AND adults. There are many intramural sporting leagues that play at these parks. Click here for details on the intramural sports and more information on all the parks and facilities in general. With over 300 acres worth of green space, Ashwaubenon has you covered for things to do in the fresh air! Here is a link to the many restaurants and bars that this Green Bay area village offers. Believe it or not, but Ashwaubenon does have other restaurants besides the Packer bars and grills you see when you’re walking around on Packer Sunday! Homes in Ashwaubenon come in all styles. There are the ranch style, 2 story, bi-level (raised-ranch), tri-level, and even the quad-level. Ashwaubenon does seem to have more contemporary styles including the popular Cape Cod style. The past year 164 homes were sold and new people moved in. The average number of days on the market was 73. 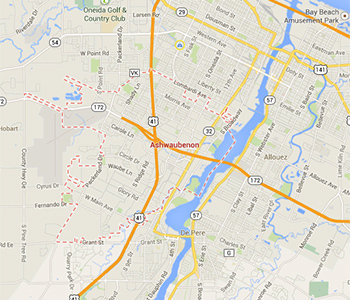 Ashwaubenon is located west of the Fox River and is bordered by the City of Green Bay on the northeasterly side. The Town of Hobart is located to the west of Ashwaubenon and the majority of the south and east is bordered by De Pere, WI. A sliver of the Village of Allouez also lies to the east. 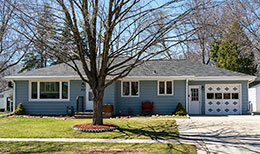 What Homes are Available in Ashwaubenon? New houses come on the market in Ashwaubenon regularly so if can’t find that perfect house today, let Elysia know what you’re looking for and she can monitor the market and alert you when something meeting your criteria is listed. Click Here for a current list of Ashwaubenon Homes for Sale.